I’m in the weeds today, going totally off-topic. This has nothing to do with writing or publishing … I should have warned you I reserve the right to be random. I’m sure it’s marked on your calendar, but it’s Bald Eagle Appreciation Day. I don’t know what you’re planning to do to celebrate. Me, I think I’ll go for a ride and reflect on what it all means. My second grade teacher was the one who told me. And who would question it – I’d read The Lorax, I wasn’t ignorant of the concept. So when my teacher told me bald eagles were going extinct, I believed. “Your children will never see a bald eagle,” she said, waggling her head in pity for us. Of course not. I’d never even seen a bald eagle, and undoubtedly never would. It was 1972 and bald eagles were going extinct. Flash forward to the present, where on any given winter morning I can spot one in the fuzzy half-dark, making slow circles from dizzy heights as I cross the bridge into Czech town. Just about any weekend I can hop in the car, Noble Hamster riding shotgun and Twister in her booster seat, and we can ride the winding river road and spot a half-dozen. One on the ice, picking at a stolen carp, another perched at the tip of towering cottonwood and still another swooping close enough to count the feathers on the upturned tips of her widespread wings. Each time we do this, I subject the kids to the story. They know it by heart but I’m helpless to stop. Just as I can’t crest the hill on Edgewood Road without hearing my grandmother’s voice say, “That’s where our old farm was” – my children are doomed to think of my second grade teacher whenever they see a bald eagle. We almost lost them – the eagles that is – and that is where the story lies. The American symbol of supreme power and authority was nearly wiped out by poaching and pesticides. At the lowest point there were only 417 nesting pairs left in the United States. In 1962, Rachel Carson published Silent Spring, warning of the dangers of the chemical DDT. It didn’t happen overnight – in fact Carson was in her grave by the time that DDT was banned in 1972. 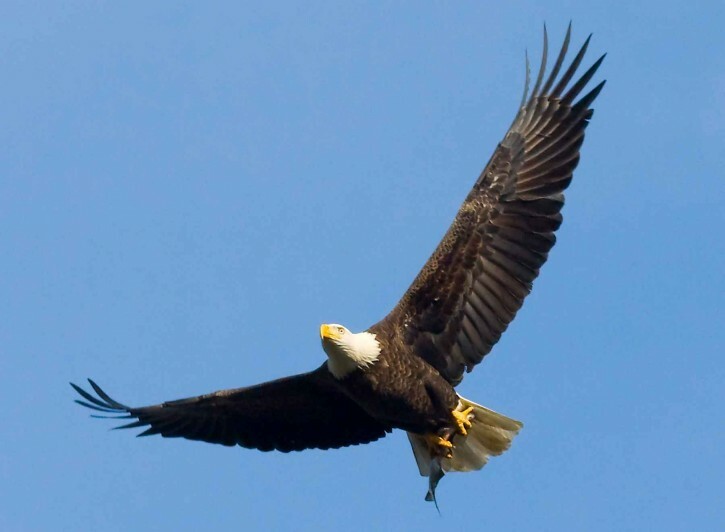 But she started something, a wheel that continued to turn and by 2007, bald eagles were removed from the endangered species list. Wonder of wonders, I heard there are nesting pairs in Manhattan. For me, this is where the bald eagle evolves into more meaningful symbol of America. Supreme power, especially at the height of the Cold War meant one thing. But supreme power in the context of this tale is a more glorious and far-reaching thing. It started when people believed, took action and worked together. A chain of people changed what seemed an unalterable course. That is the very best of us as a nation. Sure, we’re bold and mighty and brave. But what matters more than anything is that we, together, can make a difference. We can change the world; overcome even the most insurmountable obstacles and leave the world a better place for our children. What better symbol can there be?